I absolutely loved this tour. I recommend it to everyone. Very disappointed with this trip the food was excellent, however, the rest was a letdown, and certainly not worth the price paid. Great way to see the wine country. Beautiful! Great way to see the wine country. Beautiful scenery! We started our trip at the Ferry Building in San Francisco. The bus was waiting there as described. The trip to the train station was comfortable and without issue. Unfortunately, when we arrived at the train station, there was a 2 hour wait to board the train. The actual ride on the train, as well as the scenery were nice. The meal was great and the service on the train was outstanding. We were offered a small glass of wine while enjoying appetizers. For the meal itself, we were tasked to buy any additional wine. At the conclusion of the train ride, we had yet another hour and a half wait for the bus back to San Francisco. I understand that transportation was provided from many different areas however, it would be much preferred to stage the train trip closer to the arrival time. We spent 3 and a half hours waiting for a 3 hour train ride. I am not sure I would recommend this unless you were driving yourself so that arrival and departure times could be controlled a bit better. The bus dropped us off at the ferry station. We had only our vouchers to show the ferry agent. Fortunately, there were very few passengers headed back into San Francisco. He simply shook his head and let us board. The bus driver didn't know what the process entailed, so we were left to somewhat fend for ourselves with the ferry. A ferry ticket would have been helpful as well. This was a great experience and exactly as described when you book. The bus to Napa we went on a Saturday was good, the driver was informative and entertaining. The train ride was outstanding. We ate lunch in the second seating they tell you when you get there if you are first or second seating. The scenery was great. It was a a cold, rainy day. At this time of year the vineyards are bare, but the hills were green and the fruit trees were in bloom. The food and drink on the train was excellent. In our party we had the salmon, steak and chicken and everyone was very happy with their food. There was about an hour of free time before and an hour and a half after the train ride in downtown Napa. The ferry ride back to SF was fine. We didn't know there were two stops - you can get off at Pier 39/Fisherman's Wharf or at the Ferry Building where the tour started. I really had a wonderful day on this tour, I got two wine tasting boards so I drank five glasses of different wines whilst relaxing in the lounge on the first half of the tour and then the next whilst having a superb lunch in the restaurant. What a marvelous tour, relaxing, excellent service and very tasty food with some good wines from the Napa valley that your traveling through. Such a great time! Excellent food, nice staff. The train and lunch was fabulous. Great food and beautiful scenery. Explored the length of the train, all the way to the engine. One disappointment - the dome car was out for refurbishment and not there to see. 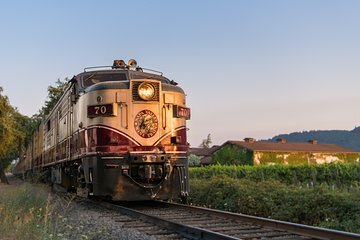 Also, if you are taking the tour on Saturday or Sunday - you will have the bus to the wine train, but you are taking the ferry back to SF - this was not clear in the paperwork. Also, left SF at 8:15 and returned at 6:00pm - allow more than the stated 7 hours. All in all, a must see and do!